Description: Satin red with garnet reflexes. The bouquet is complex reminiscent of strawberry and raspberry with hints of liquorice, while on the palate it is enveloping, succulent with assertive but mellow tannins. Vineyard site: Mazzon near Kaltern at an elevation of 400 m above sea level, a moranial south-facing light slope with excellent ventilation (important for Pinot Noir). Soils: Loamy with limestone debris, the clay content increasing with depth. Harvest period: Early to mid September: the grapes are rigorously selected to ensure only the healthiest and ripest go into this wine. Winemaking: The fermentation starts spontaneously in open wooden vats with yeasts occurring naturally in the vineyards, during which the skins are kept submerged by hand. The new wine is drained off and the skins are gently pressed two weeks after the end of the fermentation. Malolactic fermentation ensues and the wine is matured for 10 months in barriques (70 % new); the unfiltered wine is subsequently bottled where it refines for two years. Best enjoyed: As the highlight of a banquet, with game and mature red mould cheese, or savoured on its own in completive moments. "Falstaff Magazin" has rated the wine "Manincor 'Mason Pinot' Nero Alto Adige,Trentino-Alto Adige, Italy" from the vintage 2013 on 06.07.2016 with 94 of 100 points. "Falstaff Magazin" has rated the wine "Manincor 'Mason Pinot' Nero Alto Adige,Trentino-Alto Adige, Italy" from the vintage 2012 on 23.06.2015 with 94 of 100 points. "Wine Enthusiast" has rated the wine "Manincor 'Mason Pinot' Nero Alto Adige,Trentino-Alto Adige, Italy" from the vintage 2012 on 06.01.2015 with 92 of 100 points. 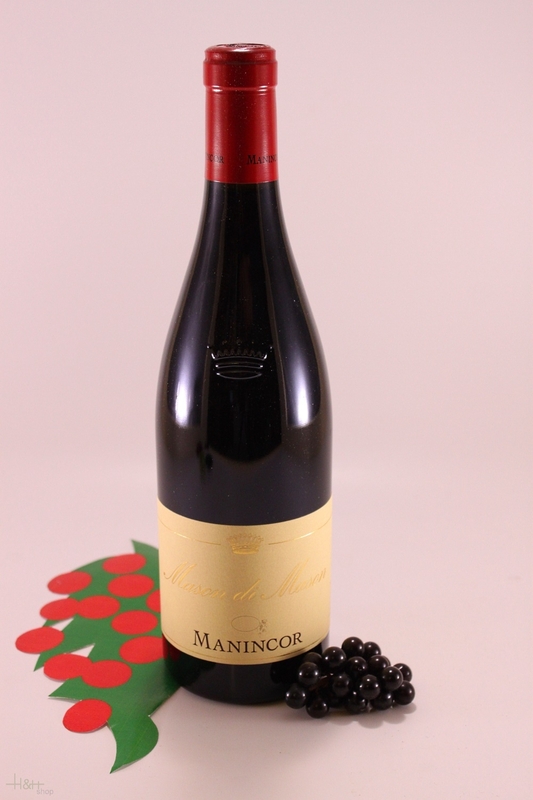 "Falstaff Magazin" has rated the wine "Manincor 'Mason Pinot' Nero Alto Adige,Trentino-Alto Adige, Italy" from the vintage 2010 on 25.06.2013 with 92 of 100 points. "Falstaff Magazin" has rated the wine "Manincor 'Mason Pinot' Nero Alto Adige,Trentino-Alto Adige, Italy" from the vintage 2011 on 25.06.2013 with 89 of 100 points. "Wine Enthusiast" has rated the wine "Manincor 'Mason Pinot' Nero Alto Adige,Trentino-Alto Adige, Italy" from the vintage 2009 on 07.01.2012 with 89 of 100 points. "Falstaff Magazin" has rated the wine "Manincor 'Mason Pinot' Nero Alto Adige,Trentino-Alto Adige, Italy" from the vintage 2009 on 13.07.2011 with 89 of 100 points. "Falstaff Magazin" has rated the wine "Manincor 'Mason Pinot' Nero Alto Adige,Trentino-Alto Adige, Italy" from the vintage 2008 on 08.07.2010 with 87 of 100 points. "Wine Spectator" has rated the wine "Manincor 'Mason Pinot' Nero Alto Adige,Trentino-Alto Adige, Italy" from the vintage 2003 on 30.06.2007 with 90 of 100 points. "Wine Spectator" has rated the wine "Manincor 'Mason Pinot' Nero Alto Adige,Trentino-Alto Adige, Italy" from the vintage 2004 on 30.06.2007 with 88 of 100 points. "Vinum Wine Magazine" has rated the wine "Manincor 'Mason Pinot' Nero Alto Adige,Trentino-Alto Adige, Italy" from the vintage 2002 on 01.02.2005 with 15 of 20 points. "Vinum Wine Magazine" has rated the wine "Manincor 'Mason Pinot' Nero Alto Adige,Trentino-Alto Adige, Italy" from the vintage 1999 on 01.01.2002 with 14 of 20 points.